In the age of the super definition HD TV, Sharp are to bring a 90 inch super size TV to Europe. It will be the largest TV ever sold in the EU. The Sharp offering will trump a rival TV from LG Electronics by 6 inches, and the company have advised viewers that they need to position themselves at least 3.5 metres away from the screen in order to be able to properly enjoy the experience. The Aquos LC-90LE757 has been on sale in the United States since June of last year, meaning that we’re not looking at especially new technology here. The reason for its delayed release has been Europe’s apparent lack of appetite for super-Sized TVs, unlike the USA market where there’s high demand for such sets. Sharp acknowledge that the EU market for such sets remains niche, but believe there is now enough demand to warrant the TVs EU launch. In the UK, a 50 inch TV is considered as super-sized, and units of this size and above are currently accounting for just 6 percent of the UK market (GFK research). Perhaps of more interest to super-sized manufacturers is the fact that these TVs account for 16% of the TV market in the UK, the disparity caused by their comparatively much more expensive price tag. Such TVs are normally flagship models, and are most likely to showcase the latest technology, such as Sharp’s 4k tech. The USA in comparison, has 8% of the market at 60 inches or above. With a World Cup coming in summer 2014, will this become a familiar household scene? World Cups have a record of driving huge spikes in TV sales in the UK. Sharp: A giant in decline? Sharp were once considered one of the largest manufacturers of TVs in the World. As a consumer electronics brand, they were amongst the most globally recognised and respected. Last year they lost $3.7 billion though, and in truth the company has been struggling for some years. Their turnaround strategy is said to focus on niche areas, and therefore the super-sized TV market in Europe makes sense. Niche areas by their definition are less competitive and often hold higher margins. The more readily available consumer channels, including TVs <50 inches in the UK, are being dominated by Samsung Electronics currently. 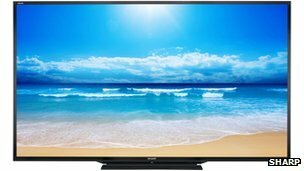 The Aquos LC-90LE757 is an LED TV, which is generally considered tyo deliver the superior picture quality when compared to the rival large screen format, plasma. This screen, due more than anything to its incredible size, weights in at 64KG and is 12 CM deep. 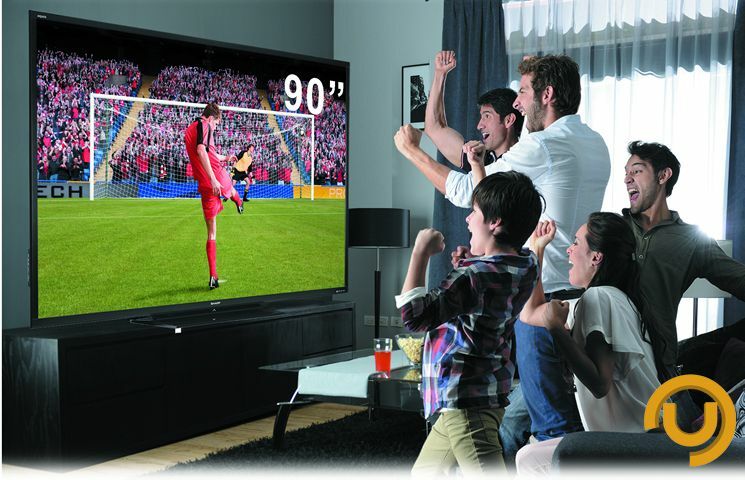 The TV boasts of super-high definition, and includes 3D capability, although the popularity of 3D technology appears to be waning, and the format is failing to garner broadcaster interest in the UK to date. Sharp are attempting to make the 3D tech more robust with this model, by using a system that they call FRED (Frame Rate Enhanced Driving). The purpose of FRED is to provide a structure which closes the gap between pixels on the screen. This in turn allows the 3D mode to be viewed effectively from a wider range of angles, overcoming the problem of having to be sat directly in front of a 3D TV to enjoy the full experience. The FRED method removes the need for the TV to produce two different images, one for each eye, which has been the method used to date by 3D TV makers. You can also utilise this Sharp TV as a form of massive digital picture frame, as it includes a ‘wallpaper mode’ which can be activated when the TV is not being used for its conventional purpose. Keen watchers and admires of TV tech may be disappointed to learn that this TV will not feature Sharp’s patented 4K technology. The 4K technology is absolutely astounding, and the company were showing off their next iteration, their 8K set, as long ago as CES 2012. There are a number of reasons cited here for the Sharp 90 inch model to not sport this tech, the main ones being a lack of 4K content and the price. The company were keen to keep the price reasonable, and as such the Aquos 90 inch TV price will be £12,000. Whilst £12k is hardly a pop to the shop and pick one up price point, it is markedly less than a TV of this size would cost with 4K tech included. “The plan is definitely to go bigger,” Mr Monetto, who heads up the Sharp product in the UK told the BBC. Whether the UK market is ready for a TV set which takes out an entire wall is quite another matter. 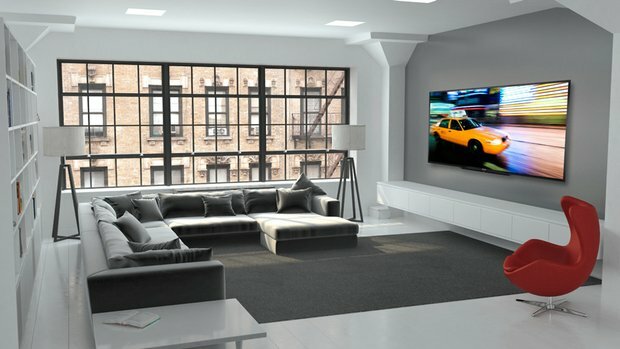 I expect that most households will struggle to agree on the need for a 90 inch TV, let alone a TV wall. That said, it’s an interesting idea being posed by Sharp, and one to keep an eye on.